What is the purpose of the water base 4 post plastic chain kit? A water base 4 post plastic chain kit is a great and economical solution to the problem of temporary fencing. 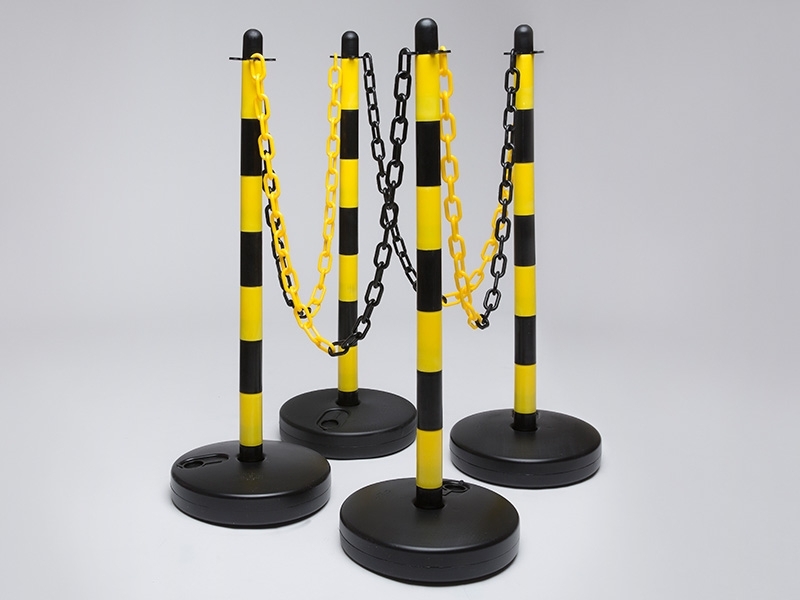 Whatever the need for temporary fencing, whether it's for crowd control or for cordoning off dangerous areas, this plastic post and chain kit fulfils all duties. The high-visibility of the plastic chain link fence makes this particular kit very useful in a number of commercial applications both indoors and outdoors. Where can this plastic barrier kit be used? The water base system makes the system stable and a good addition for areas that are busy where collisions may happen accidentally. Knocking over an unstable post can bring an entire chain section down. With the base filled with either water or sand, the chance of the post going over after being hit is minimal. 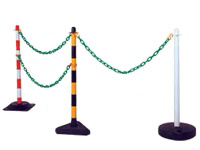 The chains are also a substantial barrier, meaning that people may have a hard time trying get over it easily. Who might use this post and chain kit? 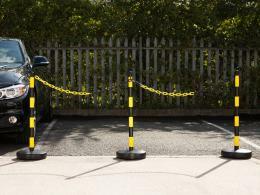 Places where there is a large volume of foot traffic, such as hospitals, malls or hotels, can stand to benefit from this temporary chain barrier system. The massive stability present in the system makes it a good way to outline certain areas that are inaccessible to the public. The system's bases can also be drained and moved around easily, making it a simple process of relocating a barrier if it is needed elsewhere. The water base 4 post plastic chain kit comes with the post and bases already mounted along with lengths of chain, making assembly a simple process. The plastic chains have a thickness of 8mm and comes in lengths of 2m, which makes it a simple process of setting up the initial barrier. All connectors and s-hooks are supplied with the kit. All of the bases are able to be filled with either water or sand, depending on the stability of the post needed.